The world’s Christian population is expected to grow from 2.2 billion in 2010 to 2.9 billion in 2050.39 Nearly one-in-three people worldwide (31%) are expected to be Christian at mid-century, the same share as in 2010. While the overall share of the world’s population that is Christian is expected to remain relatively steady, the regional distribution of Christians is projected to change. Perhaps most notably, the share of the world’s Christians living in sub-Saharan Africa is expected to grow – from 24% in 2010 to 38% by 2050 – while the share living in Europe will continue to fall, from 26% in 2010 to about 16% by 2050. The annual growth rate of the world’s population is expected to decline gradually in the coming decades, falling from 1.1% in 2010-2015 to 0.4% in 2045-2050. 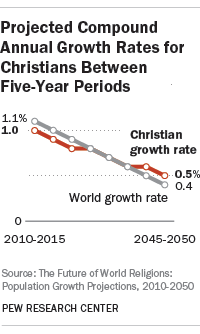 The annual growth rate of Christians is expected to remain roughly on par with world population growth. 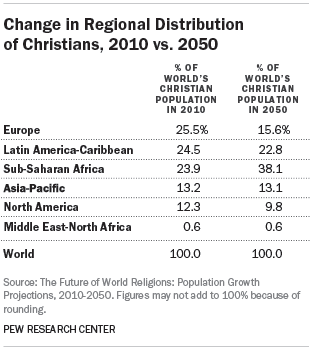 The regional distribution of Christians is forecast to change considerably by 2050. Europe is no longer projected to have a plurality of the world’s Christians; in fact, only about 16% of the world’s Christians are expected to be living in Europe as of 2050. In addition, the shares of the global Christian population residing in Latin America and the Caribbean (23%) and North America (10%) are projected to decline modestly. Meanwhile, sub-Saharan Africa is expected to become the region with the largest number of Christians – by a wide margin. 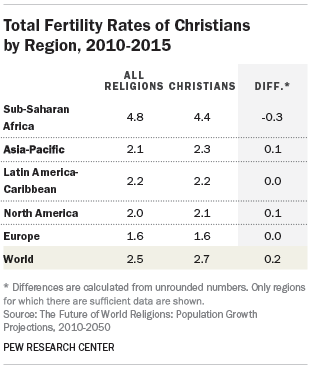 Sub-Saharan Africa’s share of the global Christian population is forecast to rise from 24% in 2010 to 38% in 2050. Europe is the only region where the absolute number of Christians is expected to decline by 2050. 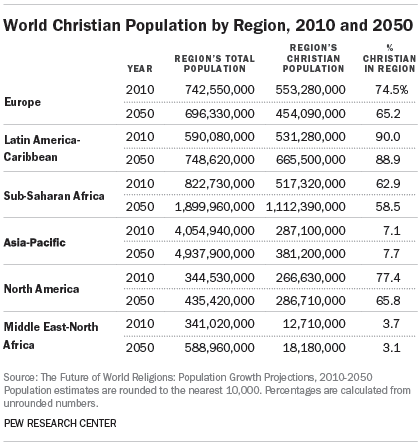 Europe’s Christian population is projected to fall from 553 million in 2010 to 454 million in 2050. During this period, the share of Europe’s population that identifies as Christian also is expected to decline, from 75% to 65%. 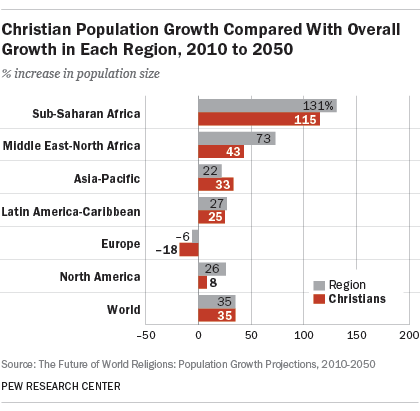 In all other regions, the absolute number of Christians is expected to grow in the coming decades. However, the share of the population that is Christian is forecast to decline within all regions except Asia and the Pacific. In sub-Saharan Africa, for example, the size of the Christian population is projected to more than double in the next few decades, growing from about half a billion people in 2010 to more than a billion in 2050. However, the share of sub-Saharan Africa’s population that is Christian is expected to drop slightly, from 63% in 2010 to 59% in 2050, because of even more rapid growth among the region’s Muslims. Between 2010 and 2050, the largest Christian population growth, in percentage terms, is projected to occur in sub-Saharan Africa (115%). However, the population growth of Christians in sub-Saharan Africa is expected to be less than in the region overall (131%). By contrast, population growth of Christians in Asia and the Pacific is projected to be higher (33%) than in the region overall (22%). The Christian population in Europe is expected to decline more between 2010 and 2050 (minus 18%) than the population in Europe overall (minus 6%). During this period, the Christian population in North America is projected to grow by 8%, much less than the region’s population as a whole (26%). Christians are expected to keep pace with global population growth largely due to their expected growth in sub-Saharan Africa. Of the 10 countries with the largest Christian populations in 2010, six are expected to decline as a share of the global population between 2010 and 2050. But three African countries (Nigeria, the Democratic Republic of the Congo and Ethiopia), as well as the Philippines, are each expected to account for a larger share of the world’s population in the decades ahead. Four countries had more than 100 million Christians in 2010: the United States (243 million), Brazil (173 million), Mexico (108 million) and Russia (105 million). Most of the 10 countries with the largest Christian populations in 2010 were majority-Christian countries. In fact, many of these countries had large Christian majorities, including the United States (78% in 2010) and Brazil (89%). One exception is China, where Christians made up only 5% of the population. Also, even though there were a large number of Christians living in Nigeria in 2010 (78 million), they were slightly less than half of Nigeria’s population (49%). About 11% of the world’s Christians lived in the United States as of 2010, while about 8% lived in Brazil and 5% in Mexico. All in all, nearly half (48%) of the world’s Christians lived in the 10 countries with the largest Christian populations. 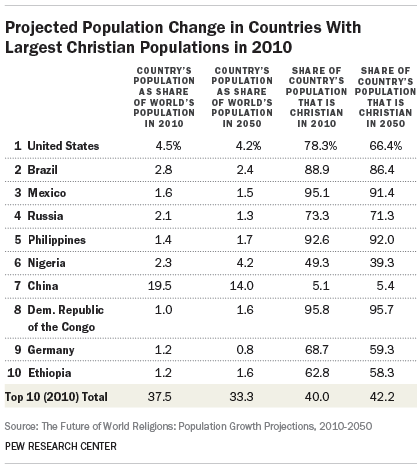 By 2050, the list of the 10 countries with the largest Christian populations is anticipated to change considerably. The United States and Brazil are expected to remain atop the list, but Mexico is projected to fall from third to sixth and Russia is expected to drop from fourth to eighth. Germany and China are not expected to appear on the 2050 list. 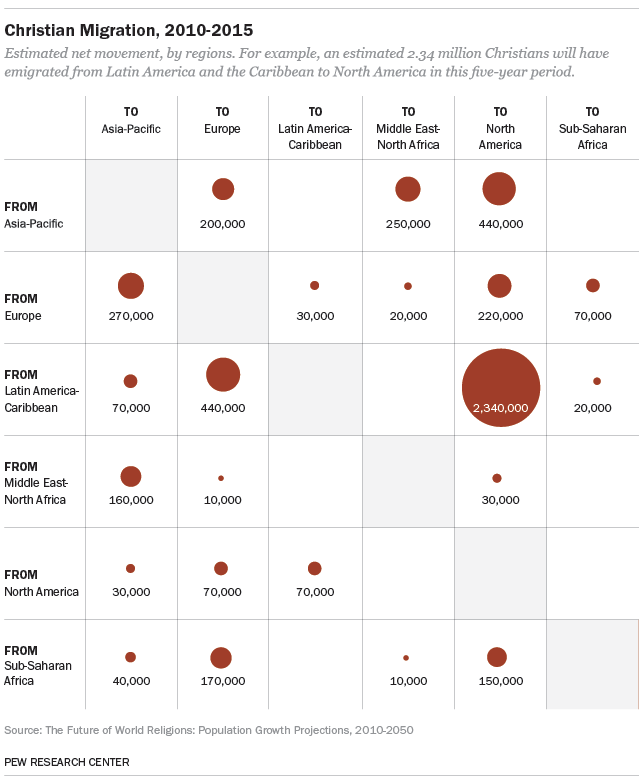 Nigeria (155 million Christians as of 2050), the Philippines (144 million), the Democratic Republic of the Congo (142 million) and Ethiopia (85 million) each are expected to rise at least one spot on the list. In fact, Nigeria is projected to have the world’s third-largest Christian population in 2050, even though Christians are projected to make up only 39% of Nigeria’s 2050 population. Two other nations in sub-Saharan Africa are forecast to join the list: Tanzania, with 94 million Christians in 2050, and Uganda (81 million). Similar to 2010, nearly half (47%) of the world’s 2050 Christian population is expected to be found in these 10 countries. 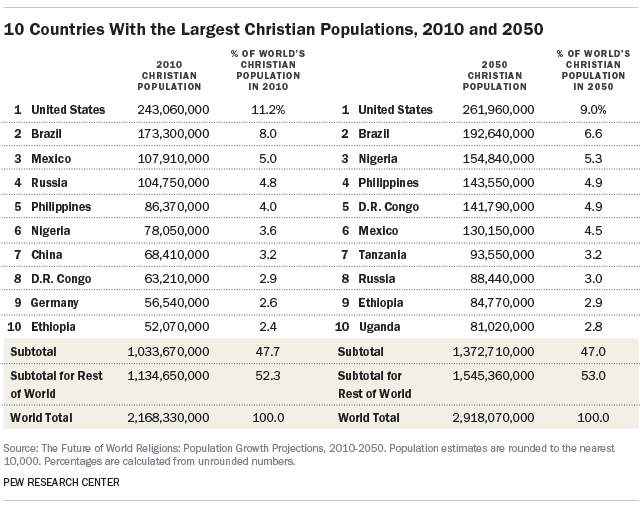 In 2050, no single country is forecast to have more than 10% of the world’s Christian population. 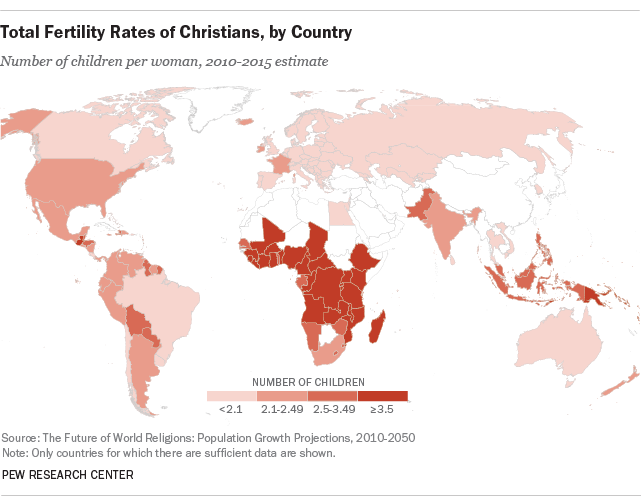 With a Total Fertility Rate (TFR) of 2.7 children per woman in the 2010-2015 period, Christians worldwide have fertility levels slightly higher than the world’s overall population (2.5), and significantly higher than the replacement level of 2.1 children per woman (the number considered necessary to maintain a stable population, all else being equal). Christian fertility rates are lowest in Europe (1.6), but are at or above the replacement level in all other regions. They are highest in sub-Saharan Africa (4.4), though Christian fertility is lower in sub-Saharan Africa than the region’s overall fertility rate (4.8), due in large part to the higher fertility of Muslims in the region. The countries where Christians have the highest fertility rates in the 2010-2015 period are Zambia (6.3) and Chad (6.2). Christians have the lowest fertility rates in Portugal (1.3), South Korea (1.3), Singapore (1.1), the Republic of Macedonia (1.1) and Bosnia-Herzegovina (1.1). Indeed, where Christians live alongside large Muslim populations, they often have lower fertility than Muslims, such as in Egypt (1.9 TFR for Christians compared with 2.7 for Muslims) and in India (2.3 vs. 3.2). An exception is Indonesia, the country with the world’s largest Muslim population in 2010; Christians there have higher fertility (2.6) than the Muslim majority (2.0). Globally, Christians were only slightly older (median age of 30) than the overall population (median age of 28) in 2010. Similarly, the age breakdown of the world’s total population is not all that different from that of the world’s Christian population. 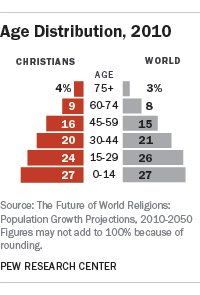 For example, 27% of the world’s Christians are younger than 15, as are about 27% of the world’s people overall. 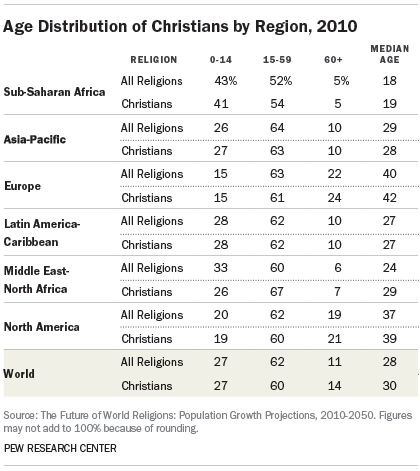 The age distribution of Christians varies dramatically across regions. The youngest Christians, as of 2010, were in sub-Saharan Africa (median age of 19), while the oldest Christians lived in Europe (median age of 42). However, in most regions, Christians were not considerably younger or older than the general population in 2010. The only exception was the Middle East and North Africa, where Christians were somewhat older (median age of 29) than the overall population of the region (median age of 24). 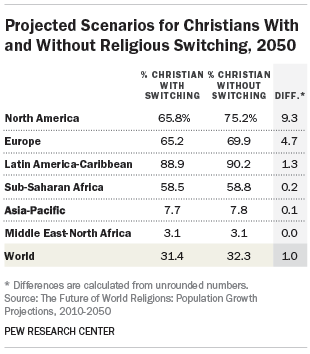 In the main projection scenario described in this report, religious switching is factored into population projections for all 70 countries for which sufficient data on recent switching patterns are available. In an alternative scenario, no religious switching is modeled in any country. Comparing results between these two scenarios provides a sense of how much impact religious switching is expected to make on the size of the Christian population in the years to come. Worldwide, religious switching is projected to have a modest impact on changes in the Christian population. Christians would make up a slightly larger share of the world’s inhabitants in 2050 (32% rather than 31%) if religious switching were not taken into account. In specific regions, religious switching is forecast to have a more substantial impact on Christian populations. In North America, Europe and the Latin America-Caribbean region, Christians are projected to experience net losses because of religious switching, with most of the switching toward no religious affiliation. 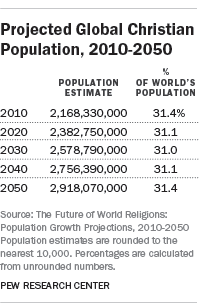 Consequently, population projections with and without religious switching can differ dramatically. In North America, for example, about 66% of the region’s 2050 population is projected to be Christian when religious switching patterns are taken into account. The expected share of Christians in North America would be as high as 75% if religious switching were not included in the projections. Similarly, the expected percentage of Europe’s population that is Christian would be nearly 70% in 2050 if no religious switching were factored in, but it is 65% when religious switching is included in the projections. Data for religious switching are unavailable for many countries in sub-Saharan Africa as well as the Asia-Pacific and Middle East-North Africa regions; as a result, population projections with and without religious switching are similar in these regions. The impact of migration on Christian populations can be seen by comparing results from the main projection scenario, which includes expected migration patterns, with an alternative scenario that does not attempt to take migration into account. 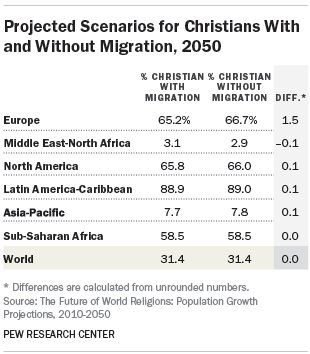 Although a large number of Christian migrants are forecast to move to North America in the decades ahead, many migrants belonging to other religions also are expected to arrive; whether or not migration is included in the projection model, Christians are forecast to make up two-thirds of North America’s population in 2050. Migration – particularly by members of non-Christian faiths – will have a more noticeable impact in Europe. When migration is included in the projection model, the share of Europe’s population expected to be Christian in 2050 is 65%, 2 percentage points lower than in the scenario that does not include any new migration (67%).